Roger Hoefling has commentated at more than 500 air, naval and military displays and ceremonies since 1971. This represents a greater rate than that of anyone else in the field in the UK, Roger being in addition the consultant or organiser for the majority of those events. Locations have ranged from Belfast to Kuala Lumpur and the Gulf to the Shetland Islands, including central London. State and official occasions in which engaged by HM Government and Ministry of Defence include the fiftieth anniversaries of the Battle of Britain; Battle of the Atlantic; D-Day; VJ-Day and the End of the Second World War; the seventy-fifth anniversary Royal Review of the Royal Air Force; Her Majesty The Queen’s Colour Presentation to the Fleet and the Armed Forces’ Day national event. As well as events for all three British Armed Services, others have been for such as the United States Air Force (USAF): see EVENTS; National Trust for Scotland; Italian Air Force; British Aerospace Plc; Rank Xerox (UK) Ltd; British Balloon and Airship Club; Royal Air Force Museum; Rolls-Royce Plc; Transport Trust; Royal Air Forces Association; Royal Air Force Benevolent Fund; Belfast International Airport; Shuttleworth Collection: see EVENTS; Defence Export Services Organisation of the UK Ministry of Defence (DESO); Armed Forces of the United Arab Emirates (UAE) and the Ministry of Defence, Malaysia. Roger Hoefling’s experience ranges from the World Hot-Air Balloon Championships in Yorkshire; designing and commentating on the fifteen-minute, formation sequence flown by sixteen Royal Navy aircraft, six Sea Harriers and ten Sea King, Gazelle and Lynx helicopters, at the Society of British Aerospace Companies’ Display at Farnborough; the D-Day fiftieth anniversary commemorations at Portsmouth in the presence of HM The Queen, the United States’ President and the Heads of State of twelve other countries, to the International Defence Exhibition (IDEX) in the UAE, the largest in the world and involving vehicle, marina and live-firing demonstrations, the latter by both day and night. Live weapons firing featured also in a series of demonstrations at sea around the UK, ‘Shop Window ‘92’, by a Royal Navy task group headed by an aircraft carrier, HMS Ark Royal, and its air group with ship-borne audiences, the involvement being as both commentator and consultant. Similarly, Roger Hoefling was fulfilling these roles for the RAF Cosford Air Show, smallest of the RAF’s then three annual air displays, when in 2000 it became the first UK air display to be awarded the Diploma of Honour of the Federation Aeronautique Internationale (FAI). In contrast, in 2013 the seventieth anniversary of the turning point in the Battle of the Atlantic, the Second World War’s longest continuous campaign, was commemorated by two services at the national Merchant Navy Memorial, a Commonwealth War Graves Commission site on London’s Tower Hill. Consulted by the Merchant Navy Association and Royal Navy, Roger Hoefling suggested incorporating readings of first-hand, Merchant Navy accounts of actions in the Battle as well as a short history of the campaign. This, in recognising the need to engage more widely and with the younger generations in particular, to help guard against the achievements and sacrifice being forgotten while also contributing to greater awareness of the UK’s increasing reliance on the sea in peace and war. Such readings are part now of the annual Merchant Navy Day Service, drawing on First World War episodes in 2014-2018 to mark its centenary. As a result, Roger Hoefling was invited to write about Merchant Navy Day for ‘The Times’. See MEDIA COVERAGE: ‘The Times’ 29.8.2015. As organiser or consultant in addition to commentator, Roger Hoefling has had responsibility for all aspects of such events ranging from road traffic management systems; public transport schemes; diplomatic receptions; emergency response plans; marketing and souvenir publications to designing, constructing and directing the flying or other demonstration itself. The latter has even extended to reconciling within a single event the flying display regulations of the UK Ministry of Defence (MoD); UK Civil Aviation Authority; North Atlantic Treaty Organisation (NATO); the United States’ Department of Defense and Federal Aviation Authority. It has meant working with a wide variety of agencies ranging from police, fire, ambulance, medical and hospital services; county, city, district and parish councils; rail, ‘bus, coach and airline companies; voluntary organisations like those for medical support, communications, welfare and the disabled; sponsors; churches; security bodies; charities; event traders; government agencies covering from roads and radio to aviation; commercial providers of such as advertising, insurance and accommodation to catering and tickets; tourism authorities; exhibitors; civilian aircraft operators and farming institutions to NATO and the international media. This, together with diplomatic, governmental and military representatives from around sixty nations as well as the world’s aerospace and defence industries. Emergency response planning has been a key aspect of the task, Roger Hoefling being responsible for new approaches to this subject in both the military and civilian fields. One was the introduction in the 1970s of multi-agency planning to MoD and United States Air Force public events. Another, introduced in 1986 and with wider, non-emergency applications, was the Special Event, now Restricted Service Licence (RSL), radio service. Roger Hoefling’s experience of event emergencies includes several fatal aircraft accidents and a murder. Less publicly, Roger Hoefling has advised on and contributed to flying display regulations and procedures for both the MoD and USAF. An example was the introduction in 1985-6 of third-party liability insurance for MoD aircraft at displays. This subject was highlighted in August 1988 when the highest number of casualties in air display history resulted from an accident involving the ‘Frecce Tricolori’, the Italian Air Force aerobatic team, at Ramstein AB in Germany, the headquarters of the United States Air Forces Europe (USAFE). As a consequence, early in 1989 the MoD was informed that while the underwriting community still had not decided it would permit displays in the UK, a 500% premium increase would be required if it did. The MoD’s response was to invite the key aviation underwriters to visit the ‘Red Arrows’ to learn how the team’s displays are designed and adapted to different venues before visiting RAF Mildenhall, the Air Fete being described by the MoD as ‘the best and best-run display’. Roger Hoefling thus briefed the underwriters on the organisation and management of both flying display and event. Subsequently, an insurance premium increase of only 25% was required for displays to resume in the UK in 1989. 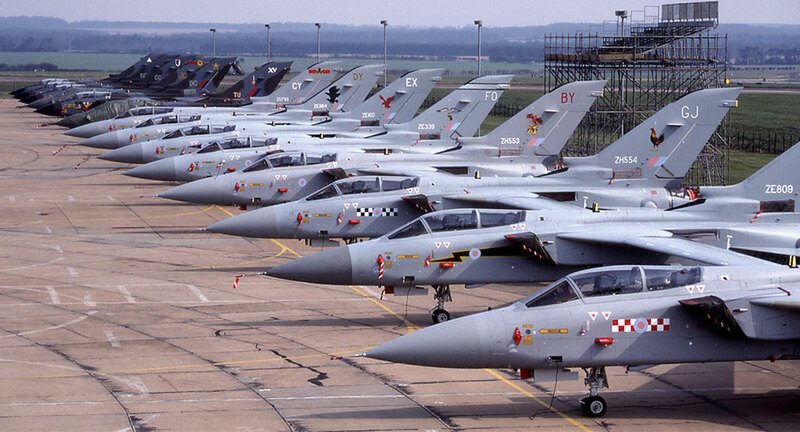 Although RAF Mildenhall is within USAFE, from 1988 the Air Fete was the only US military air display in Europe for a period. Another part played has been that of director and interviewer for the daily video news service provided to exhibitors and visitors at defence exhibitions, while an aspect of the VJ-Day fiftieth anniversary commemorations required presenting the history of the Royal Navy’s air operations, interspersed with archive material and live interviews of notable personalities, to an audience of fifteen hundred at the Fleet Air Arm Grand Reunion. Elsewhere, live audiences at events commentated upon have varied from one hundred to two million people. Finally, Roger Hoefling’s experience extends to television, film, video and radio productions, backed by attendance as a spectator at more than 300 other air, naval and military events.